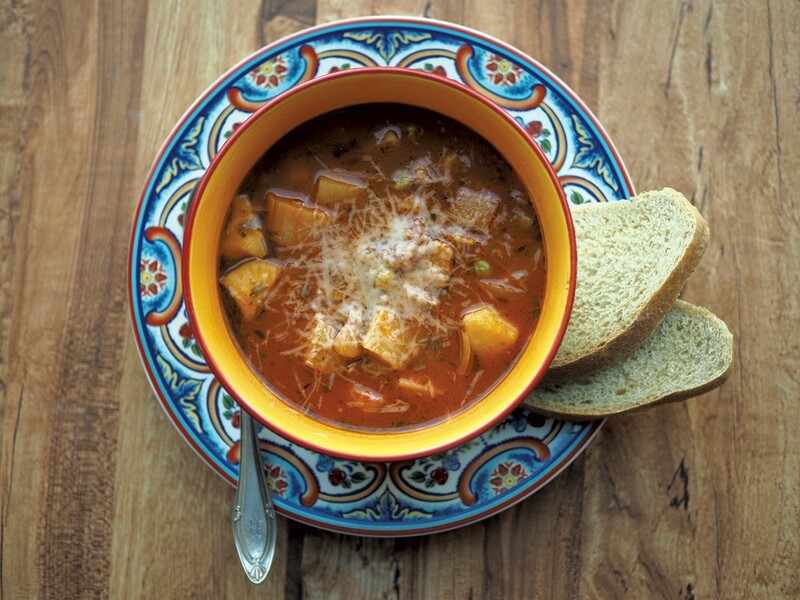 Roasted Vegetable Minestrone Soup | Mealtime | Kids VT - small people, big ideas! When the leaves change color and a chill is in the air, my thoughts turn to making soup. And I don't think anyone does soup as well as the Italians. Take minestrone, for example. While perusing my Italian cookbooks and the internet, I learned that this cornerstone of Italian cuisine is essentially a kitchen-sink soup. You can make it with whatever collection of vegetables you have on hand. Often, it includes rice or a small pasta like orzo or tubular ditalini. I decided to try my hand at a minestrone, but opted to leave out the carbs and focus on the veggies. 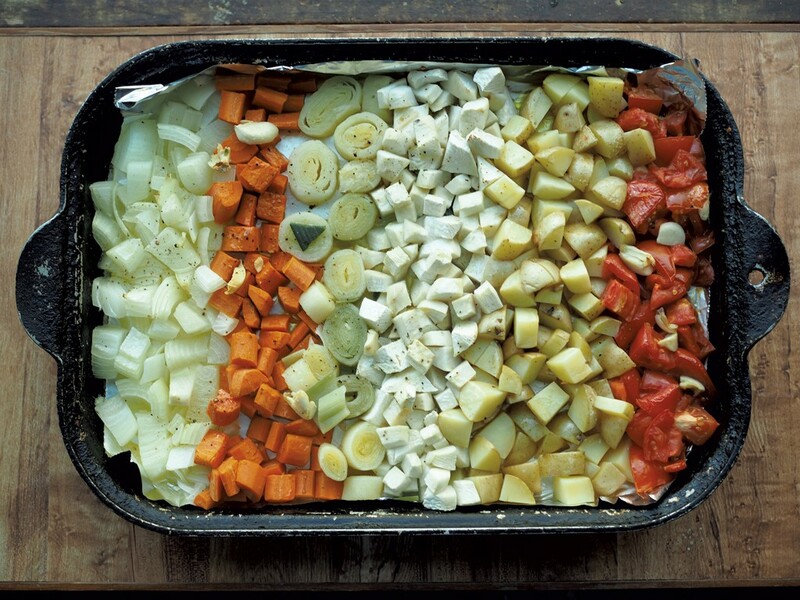 First, I roasted leeks, carrots, potatoes, tomatoes and garlic in the oven to bring out their flavors. I also used a secret Italian ingredient — the rind of a block of Parmesan cheese. Simmering the rind in the soup creates a depth of flavor that is hard to get from a store-bought broth. I also added some premade pesto, which is typical in the Genoa region of Italy. This nutritious soup is a great way to get your daily dose of vegetables, even when the summer's bounty is far behind us. Make a big pot at the beginning of the week and enjoy it for days. Or serve it to guests, accompanied by a loaf of crusty bread. As the Italians say, Mangia! Preheat oven to 425 degrees. Chop up the vegetables, except for the celery and canned tomatoes, and place on a large roasting sheet lined with tinfoil. Add the fresh garlic, drizzle with 3 tablespoons olive oil, and season with salt and pepper. Roast the vegetables for 25-30 minutes, or until soft. When the vegetables are almost done roasting, dice the celery. On the stove top, heat a large soup pot to medium heat. Add 2 tablespoons olive oil and sauté the celery until it is soft, about 5 minutes. Add the roasted vegetables to the pot, along with the cans of tomatoes, beans, bay leaf, thyme, broth and Parmesan rind. Simmer for at least 30 minutes to allow the flavors to meld.